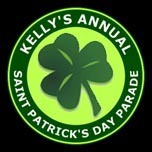 On 20 March 2011 members of the Outer Banks Detachment participated in the 22nd Annual Kelly's Saint Patrick's Day Parade in Nags Head. Although the parade was only about one-mile in length, it is estimated that between 10,000 to 15,000 spectators were in attendance. Needless to say, our detachment was able to let many local residents know that the Marine Corps League is indeed present and working to make our community a better place here on the Outer Banks. Those who participated reported that our detachment was well-received by spectators with applause and expressions of "thanks" throughout the entire parade route. Members who participated in this event were: Dean Tyler; Robert Yanacek; Bob Messinger; Gary Felder; Gene Martin, and; Kevin Wescott. 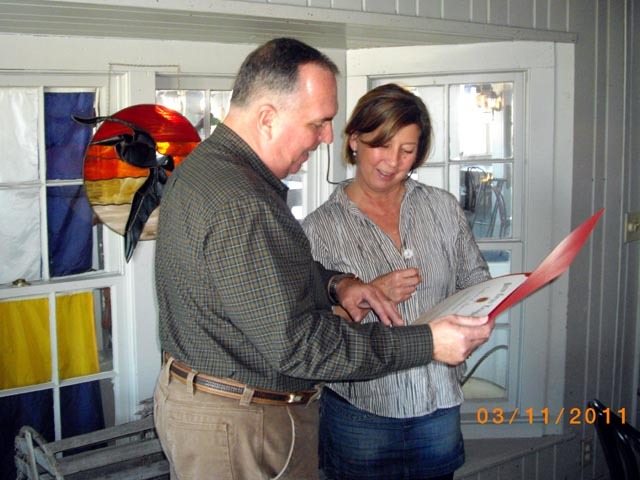 Detachment commandant, Dean Tyler, recently presented a Certificate of Appreciation to Michelle Robertson, manager of the Black Pelican restaurant in Kitty Hawk. The certificate was presented to Michelle, on behalf of our detachment, as a token of appreciation for her hospitality in accommodating our detachment for various activities, many times with little or no notice. Our detachment fundraiser is now underway and we need members to support this effort by donating a few hours of time to sell these tickets to the general public at Belk. We are selling these ticket at Belk store during our designated times. The exact dates and times are available on our detachment calendar. We strongly urge every member to support their detachment with this excellent opportunity by contacting Kevin Wescott and signing up for at least one two-hour shift. On February 22nd three members of our detachment staff attended a meeting at Belk in Kill Devil Hills to receive information and details concerning the store's semi-annual charity sale. This event is an excellent fundraising opportunity for the detachment and in the past has proven to be very beneficial in raising funds. Basically, our members sell tickets to the general public at a cost of $5 per ticket. This ticket entitles the bearer to a private sale at Belk on April 16, 2011 in which they will receive a $5 discount on each separate purchase, as well as a special storewide discount ranging from 20 to 70-percent! People can purchase as many tickets as they want and will receive a $5 discount for each ticket as well as the storewide discounted prices, however they are only permitted to use one $5 discount ticket each time they pay at a cash register. Each ticket sold by our members goes directly to the detachment to further our mission. So, if we sell 500 tickets, the detachment will raise $2,500. This is a rare situation where everyone wins: Belk receives money for the sale of items and a charitable contribution tax write-off; the detachment receives the proceeds from our ticket sales, and; those who buy tickets get their $5 back in the form of a discount as well as some really excellent discounted prices on high quality products. At the upcoming March meeting we will be passing out tickets to members and will be asking them to sign up to donate a few hours to sell these tickets to the general public at Belk. We will be selling these tickets at Belk on our assigned dates and times, which are primarily on the weekends. The exact dates and times are available on our detachment calendar. We strongly urge every member to support their detachment with this excellent opportunity. Gung-Ho, Marines! Detachment commandant, Dean Tyler, recently presented a Certificate of Good Citizenship on behalf of our detachment and the Marine Corps League to Bryan Robison of Boy Scout Troop #117. 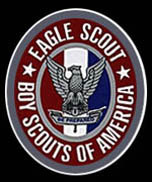 Bryan was presented this award in recognition of his attainment of highest level of scouting accomplishment—Eagle Scout. 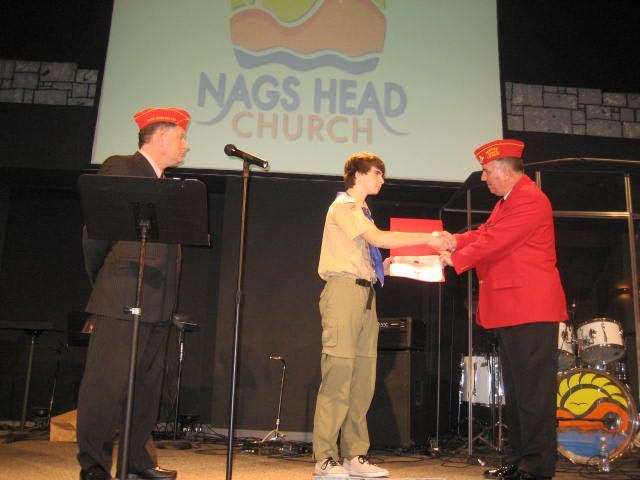 The presentation was made at his Court of Honor at Nags Head Church on Saturday, 4 March 2011. In addition to our commandant, our eagle scout recognition officer, Kevin Wescott, and our chaplain, Rick Lawrenson, were also in attendance at the ceremony. On behalf of the Outer Banks Detachment, we extend our congratulations to Bryan and his family for this noteworthy accomplishment, and extend our best wishes to him in all of his future endeavors. 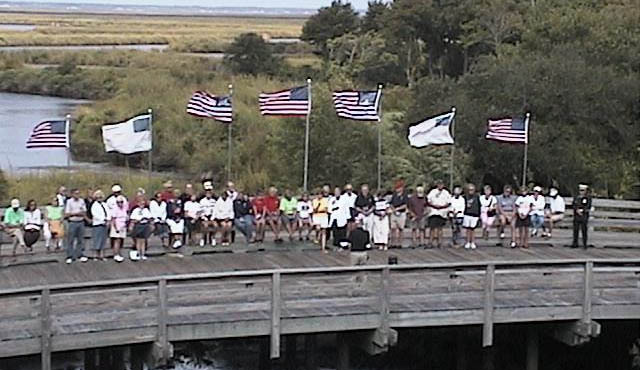 On September 11, 2007 at 10:00 am over 50 citizens of the Currituck Outer Banks/Corolla gathered on the wooden bridge on Hunt Club Drive, The Currituck Club to remember the cowardly attack which took place on America six years ago. For the second year, The Currituck Club hosted the event, installed commemorative flags on the bridge and invited local citizens for a somber remembrance of the price of freedom. Resident, Doug Wendling [Commandant, Marine Corps League, Outer Banks Detachment #1264] reminded the assembly of the time line that fateful day; American Airlines, Flight 11/United Airlines, Flight 175/American Airlines, Flight 77, and United Airlines, Flight 93. He spoke of the thousands of Americans who have died in the cause of freedom and independence from tyranny. The group was asked to ‘never forget’ the sacrifices made, and continuing to be made by our military and emergency services personnel. Currituck County Sheriff’s office [Officer Price], and numerous Corolla Fire and Rescue, and Currituck County EMS personnel participated, as well. Pastor John Strauss, Pastor of the Corolla Chapel [and, coincidently Chaplain for the local Marine Corps League Detachment] provided a brief but poignant invocation asking that participants keep all people who are involved in the war on terror and those who are innocent victims in their prayers. 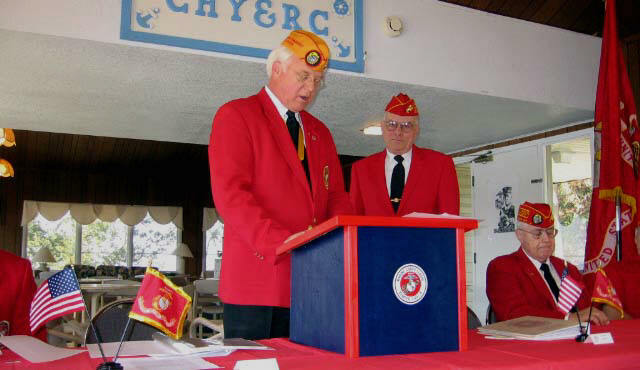 On 30 June 2007, Marine Corps League, Outer Banks Detachment #1264 Commandant, Doug Wendling and Adjutant/Paymaster, Bob Messinger participated in the Eagle Scout Court of Honor for Charles Graham Yates of Troop 165, Manteo, NC. The new Eagle Scout received a variety of awards including those from the Secretary of Defense, Chairman of the Joint Chiefs of Staff, Federal Bureau of Investigation, North Carolina General Assembly, State Senate and House of Representatives. Also on hand to present awards were the American Legion (Manteo Post) and Marine Corps League. Commandant Doug Wendling presented Yates with a certificate from Marine Corps League, Department of NC and another for the Outer Banks Detachment #1264,stated that the Boy Scout Laws embodies many of those qualities integral to the United States Marine Corps and offered congratulations on his achievements on behalf of National Headquarters, Marine Corps League. 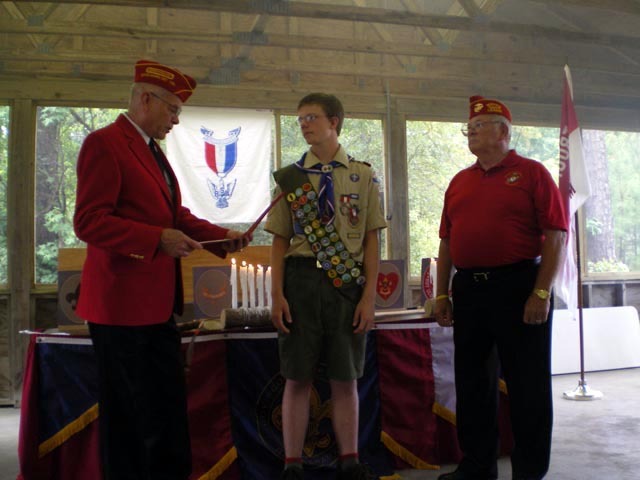 Adjutant/Paymaster Bob Messinger, shared his scouting experience with Charles, congratulated him and reminded him that just as "Once a Marine, always a Marine", the same is true for him..."Once and Eagle Scout, always an Eagle Scout." It was a touching ceremony and demonstrated the pride which his parents and his community share in his achievement of this rank. George Barlow of Kill Devil Hills has a proud Marine heritage that he displays everyday on the Outer Banks—rain or shine. Although George has never served in the Marine Corps, he owns and drives motorcycles that honors the Marine Corps service of his father, and his son, both Marine veterans. George's father served as a pilot with Marine Bombing Squadron Four-Thirteen (VMB-413) during the Second World War, while his son served four years including, a tour in Afghanistan. George displayed both of his motorcycles recently at the Outer Banks Bike Show and received a personal visit from our Commandant, Doug Wendling. 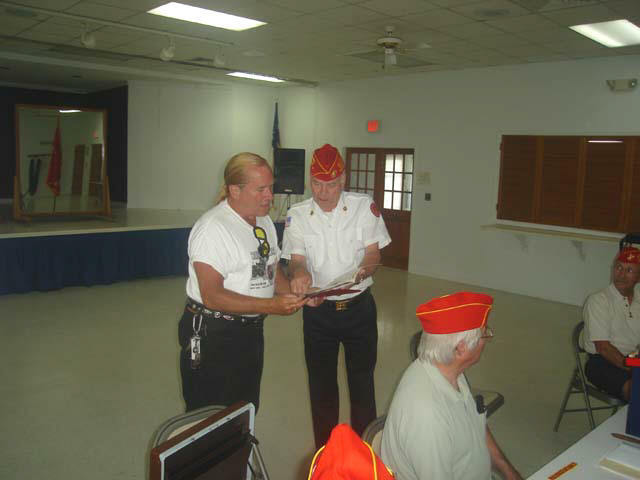 In recognition of his efforts to honor and portray the Marine Corps in a favorable light, George was presented with the Marine Corps League "Certificate of Appreciation for Patriotism and Loyalty" at the 12 June 2007 meeting. We extend our appreciation and best wishes to George for his noteworthy efforts. The Eagle, Globe and Anchor of the Marine Corps flew over the Colington Harbour Yacht Club on a sunny morning this past February. 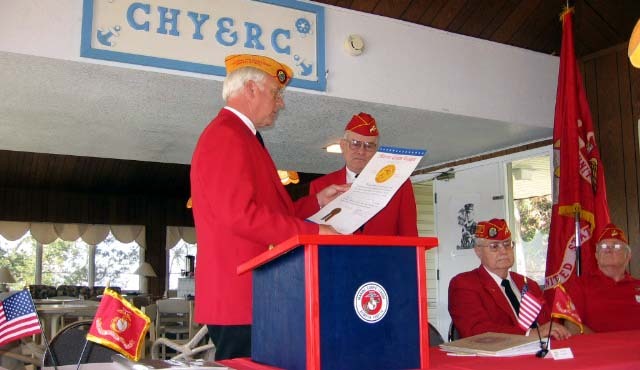 Inside, wearing red blazers and covers, the newly elected Commandant Doug Wendling, and the officers of the Outer Banks Detachment of the Marine Corps League received their official charter from the National Headquarters. The Semper Fidelis motto of the U.S. Marine Corps, meaning "always faithful", was apparent in those attending the charter presentation. Yet, in spite of the seriousness of purpose, there was also a deep sense of camaraderie—a testament to the continuing solidarity of the Corps. Serving as a fellowship for the Marines that choose to join, the League is a way for these former soldiers to continue to uphold their pledge of honor and duty. The Marine Corps League was founded in 1923 by World War I hero, Major General Commandant John A. Lejeune. The League received its Federal Charter by an act of congress and was signed and approved by President Franklin D. Roosevelt in August 1937. It is the only Federally Chartered Marine Corps veterans organization in the country with a membership of nearly 61,000 active duty and reserve Marines, honorably discharged veterans, and qualified Navy FMF corpsmen. It is one of the few veterans organizations that experiences in its membership each year. An all-volunteer organization, it bands together with current and honorably discharged Marines and promotes the ideals of freedom and democracy, to aid all current and former Marines and their families, and to preserve the traditions of the Marines—such as observing the anniversaries of historical occasions of interest, and the Marine Corps birthday, every November 1. The Outer Banks Detachment was initiated by Commandant Wendling months ago. 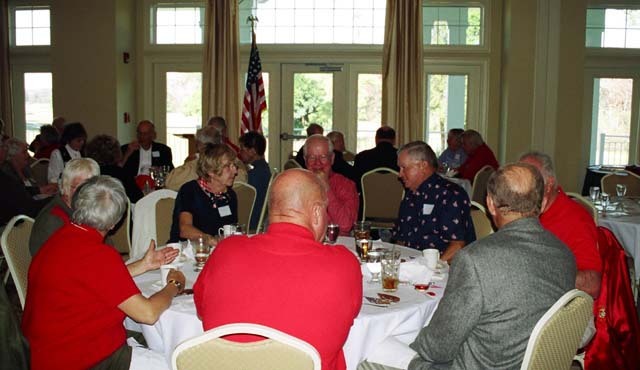 After a tremendous turnout for the Marine Corps Birthday luncheon he hosted in 2005, he discovered there were more Marines in the area than he had initially realized. Someone suggested a League detachment, and the rest, as they say, is history. In addition to activities with the League, Commandant Wendling is also involved in the Marine Corps Memorial Association, the American Legion, and other military organizations. A veteran of the Vietnam War and with service on Okinawa, after six years of active duty, he left the service with a rank of corporal. Upon returning home from the war and completing his education, Commandant Wendling joined the administration of San Jose City College. In 1978 he went to work for Phillips Semiconductors and retired in 2005 after 25 years with the company. He and his wife, Elizabeth then relocated to the Outer Banks. First and foremost, the League is a service organization. Asked what the mission of this detachment would be, Commandant Wendling responded "There are many community services being performed very well here in the Outer Banks right now. But we intend to take care of Marines and their families, veterans, and other in need of our help. We have implemented a volunteer driver program in which members have volunteered to drive fellow Marines and other veterans up to the Hampton Roads V.A. hospital for appointments, to the airport, or whatever transportation assistance they may need." 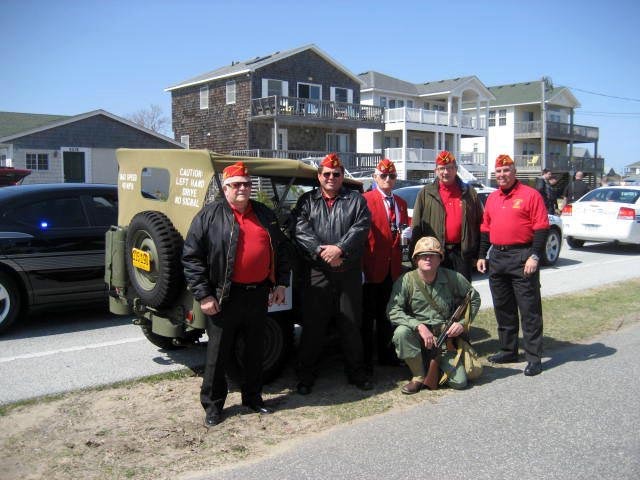 Additionally, both Commandant Wendling and Sergeant-at-Arms Robert Yanacek cited the Outer Banks Boy Scout troops as representing the ideals of courage and honor the mirror those of the Marine Corps. "The Boy Scouts have a neat linage established with the Veterans History project, operated by the Library of Congress," he said. The league my also become involved in supporting the Marine Corps Reserve with their annual Toys for Tots program. Ultimately, what activities the detachment chooses to support is a member decision and the members will further define those initiatives it will pursue with classic Marine Corps diligence. For the Charter Presentation, Commandant Steve Wilson from the National Headquarters and Commandant Peter Meletis of the North Carolina Department presided over the ceremony. A photo of Lewis B. "Chesty" Puller was also proudly displayed. In a ceremony rich in tradition, Commandant Meletis presented the Marine Corps Colors to Commandant Wendling, symbolizing the transfer of authority. Commandant Wilson presented the official charter that was signed by all 26 charter members. Members - Dan Beall, James Buckley Jr., F. Kelly Chamberlain, Frank D. Draper, Kurt A. Duncan, Thomas Fentress, Dan Fillmore, Ron Gibson, Matthew B. Greene, Arthur T. Hildebrand, Ron Mason, Kevin J. McGrath, Joseph T. Montgomery, Bill O'Brien, Dan Robertson, Leonard Stone, Chuck Straub, Richard Sulik, and Robert VanZee. Those interested in supporting (donations are always welcome) or joining this detachment of the Marine Corps League should contact Adjutant/Paymaster Bob Messinger at 252-441-6559. Their website, obxmarines.com was voted one of the top 10 Marine Corps websites on the Internet and is full of useful information about the League and this detachment specifically. With a brief ceremony conducted Saturday at the Colington Harbour Yacht and Racquet Club, Doug Wendling became the commandant of the newly chartered Outer Banks Detachment of the Marine Corps League. Only minutes prior to Wendling taking command, national vice commandant Steve Wilson presented the group with its official charter recognizing the chapter as one of hundreds of Marine Corps League units serving the needs of over 62,000 men and women, officer and enlisted, reserve, retired and honorably discharged Marine Veterans and Navy corpsmen. The Marine Corps League was founded in 1923 by then, Major General Commandant John A. Lejeune. With a charter approved by an act of Congress, the league is the only federally chartered Marine Corps related veterans organization in the country. In remarks delivered shortly after taking the oath of office, Wendling commented, "This charter... will be signed by each of our charter members: prominently displayed at each detachment meeting and serve as a reminder to each of us, our duty to continue in the service of our country and fellow citizens." In attendance were the 25 charter members and families along with Department of North Carolina Commandant Peter Meletis, and commandant for the Down East Detachment 1186 and vice commandant for the Northeast District, Ron Cooper. Meletis and Cooper were instrumental in assisting with the formation of the Outer Banks detachment. Prior to awarding the charter, Wilson told the group, "On behalf of the the national Commandant, John Ryan, we congratulate you for the job you have done in the formation of this new detachment. Welcome aboard, Marines." After presenting the charter, Wilson administered the oaths of office for the first leadership team for the Outer Banks Detachment. Wilson swore into office Wendling as commandant, Robert Messinger as adjutant, Lee Baronet as judge advocate and Robert Yanacek as sergeant-at-arms. According to Wendling, work started in July, 2006 to form the new Outer Banks Detachment. He went on to praise his fellow officers saying, "I must acknowledge the energy and enthusiasm of our detachment officers. You have helped to ensure that this fledging organization will grow and become one of the premier detachments in the Department of North Carolina. We are here to assist our Marine brothers and sisters and to help you implement your ideas for helping people in our community have a better life." The Outer Banks Detachment plans to conduct a number of projects to help those in need in the community throughout the year. 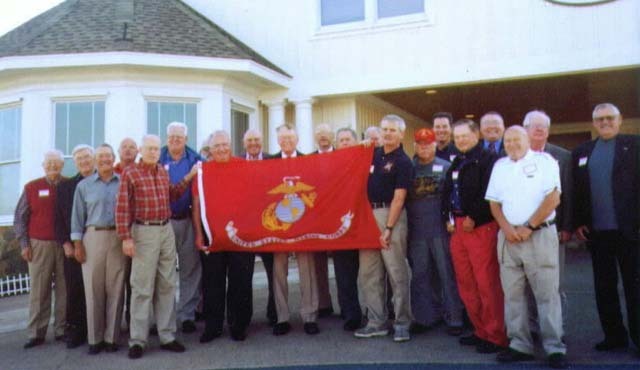 A group of retired and inactive Marines met November 18th at the Duck Woods Country Club to organize an Outer Banks Detachment of the Marine Corps League. The Down-East Detachment's commandant, Ron Cooper and the junior vice commandant of the same detachment, Allen Simonowitch, were in attendance to give guidance and direction to the group as they work through the organizational process. Unanimously elected as the first commandant for the Outer Banks was Doug Wendling. Appointed chaplain for the group was Pastor John Strauss from the Corolla Chapel who served on active duty during the Korean Conflict. The full roster of officers will be announced in early January when we announce the date we will receive our Charter. Membership is open to all active and inactive Marines in our Eastern North Carolina area. The League is active in charitable events of which Toys for Tots is probably the best known. The League which was founded in 1923 was authorized by an Act of Congress on August 4, 1937 to help veterans with VA claims. Social events include the November 10th birthday celebration and a Marine Corps Ball. At present it looks as if there will be monthly meetings from September through May taking time off during the busy season here on the Outer Banks. The regular meetings for the time being will probably be on Saturdays. Those active or inactive Marine Corps veterans can contact newly elected commandant, Doug Wendling for information on becoming a member. Call 252-457-4009. On November 10th, local Marines celebrated the 231st birthday of the United States Marine Corps with a luncheon at Duck Woods Country Club in Southern Shores, NC from 1100 to 1430. Approximately 30 Marines, including Navy Corpsmen, gathered for the second annual event on the Outer Banks to observe the authorization by the Continental Congress of Marine first and second battalions on 10 November 1775 at Tun Tavern in Philadelphia, PA. The Marines, accompanied by their spouses and guests, enjoyed the opportunity to share their experiences, meet new friends and renew old acquaintances. Ranks of those who attended ranged from Private First Class to Brigadier General. Most served regular enlistments, although there were several retirees in the group. The oldest Marine present is a veteran of WW II. The youngest Marine member, represented by his parents at the luncheon, is currently serving his second tour in Operation Iraqi Freedom. A Birthday Message from the Commandant of the Marine Corps, General Hagee, was read by the senior ranking Marine present, and the traditional cake cutting ceremony was performed. Several participants shared their Marine experiences with the audience; some in solemn remembrance and some with a good dose of military humor. Organizers of the event, Lee Baronet and Doug Wendling of Corolla, then treated guests to a variety of door prize drawings. Announcement of a meeting of the Marine Corps League, Outer Banks Detachment for Saturday, 18 November, was made and attendees were urged to attend that organizational meeting. It is anticipated that the Detachment Charter will be applied for before year-end. This group of local Marines gathers informally throughout the year. Those interested in learning more about the organization and its activities may contact Doug Wendling at 252-457-0409. On November 10, there was an event on the northern Outer Banks that was a first of what is hoped to be come an annual event. That was the day the Marine Corps celebrated its 230th birthday. Those who were ever in the Marines and those who still are, know that November 10 is always observed with a minimal but necessary duty and an extra good dinner fitting of a birthday celebration. One of our local ex-Marines celebrated by himself last year and made up his mind that it was the last year he would be celebrating alone. The word went out earlier this year that there would be a celebration for ex-Marines in the area. There were 49 persons in attendance, including some spouses and widows of Marines. The ranks of those who attended were from Pfcs to generals. Most served regular enlistments, and there was at least on from the Korean War era present. The oldest was in his 80's, and had served in the Second World War. The youngest was a young man who was discharged a few weeks prior and had served two tours of duty in Iraq. Besides the wonderful meal served at the Currituck Club restaurant, there was a birthday cake and a message from the Commandant of the Marine Corps. There was also a period of time allotted to tell stories of interesting things that happened while on active duty. Everyone seemed to enjoy the time of fellowship before the formal program began. Some were surprised at who was there because they knew each other from social settings but had never realized that they were both ex-Marines. Those present decided that this should be an annual event and are looking for more ex-Marines who reside in the area to join us next year on November 10, 2006.